It was confirmed on the Warner Bros. website that Part 1 composer Alexandre Desplat would return to score Part 2. In an interview with Film Music Magazine, Desplat stated that scoring Part 2 is "a great challenge" and that he has "a lot of expectations to fulfill and a great deal of work" ahead of him. Desplat started writing the music in early 2011 and finished recording with orchestrator Conrad Pope and the London Symphony Orchestra on 27 May 2011 at Abbey Road Studios, as stated on Pope's official Facebook page. Actress Evanna Lynch confessed in 2011's LeakyCon that she was invited to the scoring sessions, when Desplat was recording the music for the Gringotts sequence. The main theme of the film, "Lily's Theme", was performed by Mai Fujisawa, daughter of Japanese composer Joe Hisaishi. In the film, several tracks are re-used from previous Harry Potter films, which are not included in the released soundtrack: a variant of "Hedwig's Theme"', originally composed by John Williams, which plays during a scene in Harry Potter and the Chamber of Secrets, is used twice in Part 2. The first time is when Harry, Ron, and Hermione meet with their friends in the Room of Requirement. Critics have claimed that this has added strongly to the deep, moving feelings made and the sense of hope given to the audience. The second time is when Snape is sent out of the castle, and the Order of the Phoenix takes over control. "Dumbledore's Farewell", composed by Nicholas Hooper for Harry Potter and the Half-Blood Prince, is connected to Desplat's "Severus and Lily" track, which plays during the "Prince's Tale" sequence. A variant of Hooper's "The Kiss" from Harry Potter and the Order of the Phoenix also makes an appearance throughout the Hogwarts viaduct scene. The final scene of Part 2, set 19 years into the lives of the trio, features "Leaving Hogwarts", composed by Williams, followed by the suite of "Hedwig's Theme" for the end credits. Desplat spoke of the use of Williams's theme in Part 2, saying, "Well, we all know there's one theme, which has become iconic, Hedwig's Theme from John Williams. This theme is crucial to the success of the story, and it would have been disrespectful and stupid for me not to use it at the crucial moments where we need to refer to these ten years of friendships that we've all had with these characters and kids, so 'Hedwig's Theme' does reoccur a lot more [than] in Part 1 where loss of innocence was the main theme of the film [...]"
The soundtrack received critical acclaim. Jorn Tillnes of Soundtrack Geek gave the soundtrack a 9/10 and noted, "Part 2 ends in anything but tears. It is a joy to listen to just like Part 1 and using the Hedwig's Theme by John Williams, which is the ultimate Harry Potter theme after all, is a brilliant touch." Christian Clemmensen of Filmtracks gave the soundtrack an overall rating of 4/5, the music as heard on the album 3/5, and rated the score in the context of the film a 5/5, and commented, "Desplat finally proves that his style can transcend his obvious technical mastery of an orchestra and reach levels of tonal majesty that can be summed up in a single word: epic." Danny Graydon from Empire Online gave the soundtrack a 5/5 rating, and said "Just as John Williams created Harry Potter’s musical language, Alexandre Desplat succeeds magnificently in completing it. Desplat crafts a highly emotional thematic anchor with its strings and solo vocalist." Another review came from Allmusic.com; James Christopher Monger gave the soundtrack a 3/5 and commented, "Bombastic, sinister, and triumphant, the appropriately dark and apocalyptic Deathly Hallows, Pt. 2 may sit near the bottom of the Potter soundtrack pile, but it can hardly be called a failure." Later, a review came from Jonathan Broxton of Movie Music UK, who rated the score 5/5 stars, and commented, "I can’t speak highly enough of Desplat’s achievement in concluding the Harry Potter franchise the way he has..., Harry’s story was always about death, and Desplat’s decision to build his score around a musical motif representing those departed souls was a perfect one. This is one of the scores of the year." Evening Hour rated the soundtrack 4.5/5, commenting, "Desplat has proved to be a formidable force in the success of the Deathly Hallows films, seamlessly blending emotional nuance with action-packed grandeur. He has, in short, created a satisfying and richly layered aural landscape that I will always love coming back to." Amazon.com announced the release date for the soundtrack as 12 July 2011. It was released on iTunes the same day. The track listing for the Harry Potter and the Deathly Hallows - Part 2 soundtrack was released on 16 June 2011. All cues are produced, conducted and composed by Alexandre Desplat. Previews of the tracks were released on 23 June 2011. ↑ "Alexandre Desplat - Composer of Part 1 and 2 (NOTE: Click "About the Movie", then "Filmmakers", then "Alexandre Desplat"". Harrypotter.warnerbros.com. Retrieved 1 August 2012. ↑ "Deathly Hallows Composer Alexandre Desplat on Part 1 and 2". Filmmusicmag.com. Retrieved 1 August 2012. ↑ "Conrad Pope: Deathly Hallows Part 2". Facebook.com. Retrieved 1 August 2012. ↑ "Mai Fujisawa". Last.fm. 4 July 2012. Retrieved 1 August 2012. ↑ "Alexandre Desplat and scoring the Courtyard Apocalypse". 19 July 2011. Retrieved 6 July 2011. Will we hear any themes inspired by the work of Patrick Doyle or Nicholas Hooper? Alexandre: I don’t think you will hear themes by Patrick Doyle. Nicholas Hooper you might, but that’s a surprise you will have when you see the film. ↑ "Interview with Alexandre Desplat". Retrieved 19 July 2011. ↑ "Soundtrack Review: Harry Potter and the Deathly Hallows Part 2 (2011)". Soundtrackgeek.com. Retrieved 1 August 2012. ↑ "Filmtracks review for Deathly Hallows Part 2". Filmtracks.com. 12 July 2011. Retrieved 1 August 2012. ↑ "Empire's Harry Potter and the Deathly Hallows Part 2 Review". Empireonline.com. Retrieved 1 August 2012. ↑ Christopher, James (5 July 2011). 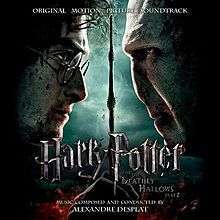 "Harry Potter and the Deathly Hallows, Part 2 (Original Motion Picture Soundtrack) - Alexandre Desplat : Songs, Reviews, Credits, Awards : AllMusic". Allmusic.com. Retrieved 1 August 2012. ↑ "HARRY POTTER AND THE DEATHLY HALLOWS PART II – Alexandre Desplat « MOVIE MUSIC UK". Moviemusicuk.us. Retrieved 1 August 2012. ↑ "Soundtrack Review: Harry Potter and the Deathly Hallows, Part 2 by Alexandre Desplat". Eveninghour.org. 1 August 2011. Retrieved 1 August 2012. ↑ "Harry Potter & Deathly Hallows Part 2: Alexandre Desplat: Music". Amazon.com. Retrieved 1 August 2012. ↑ "Soundtrack Movie.com". Soundtrack Movie.com. Retrieved 1 August 2012. ↑ "SOUNDTRACK / ALEXANDRE DESPLAT - HARRY POTTER AND THE DEATHLY HALLOWS PART 2 (ALBUM)- Austria". Retrieved 30 March 2011. ↑ "SOUNDTRACK / ALEXANDRE DESPLAT - HARRY POTTER AND THE DEATHLY HALLOWS PART 2 (ALBUM)- Mexico". Retrieved 30 March 2011. ↑ "SOUNDTRACK / ALEXANDRE DESPLAT - HARRY POTTER AND THE DEATHLY HALLOWS PART 2 (ALBUM)- Swiss". Retrieved 30 March 2011.